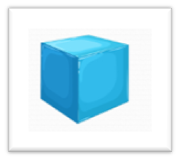 A cube is a three-dimensional figure with six square faces. When it is moving through space then it will become thicker. All cubes have six sides, one is the top, one is the bottom, and rest four sides make a square together. To count the sides of the cube, you have to look at the image carefully because two sides are hidden. All faces meet other four faces they form squares. All the plane angles are right angles and vertices meet 3 faces. The opposite edges on the cube are parallel to each other. a is the side length of the cube. Question 1: What is the surface area of a cube of side 5 cm ? The applications of cubes are common in daily mathematics like to compute power or exponents. This is also easy to find the side of a cube if the surface area or volume is given. In this case, you just need to rearrange the formula to compute the length of the side of a cube. Further, cubes are also used in designing multiple things like containers, cardboard box, or wooden blocks for construction etc.